Iran’s Supreme Leader says the international community should rid itself of "the arrogant front led by the United States." Iran’s Supreme Leader, Ayatollah Ali Khamenei, called on Sunday for “resistance against the evil powers”, Press TV reports. Khamenei’s comments were made during a meeting with the speaker of the Iranian parliament and other Iranian lawmakers in Tehran, during which he declared that the struggle against evil powers will end only after the international community rids itself of the arrogant front led by the United States. 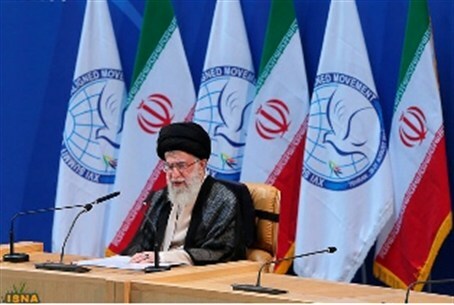 “This task calls for a hard and long struggle and major strides,” Khamenei pointed out, according to Press TV. He stressed the need to maintain the ideology of “combating the arrogance front” as a means to achieve the goals of the Islamic Republic. “The reason behind the emphasis on the campaign is not the Islamic establishment’s warmongering, but wisdom and logic necessitate that one equip oneself in order to pass through a region swarming with pirates, and have the ability and motivation to defend oneself,” he was quoted as having said. Khamenei emphasized that the solution to the country’s economic and political problems would not be found outside its borders and that officials must rely on indigenous capacities and capabilities as real solutions. He said Iran can solve its problems only by resorting to what he termed “resistance economy” and not looking to foreign countries. “Those who want to promote compromise and submission to bullying powers, and accuse the Islamic establishment of warmongering are in fact committing treachery,” declared Khamenei. He further noted that under the current circumstances, there is no option but to continue with resistance as the guiding principle in all of the country’s internal and external affairs. Earlier this month, Khamenei said that Western expectations for the Islamic Republic to limit its missile program were "stupid and idiotic". In the past, he has declared that Tehran will never give up its nuclear program. Khamenei’s rhetoric against the U.S. is nothing new. Several months ago he called on the Americans to “exercise self-restraint,” after Secretary of State John Kerry said the military option was still on the table if Iran fails to live up to its part of the agreement that was signed with it in Geneva.